Description: Our handcrafted chypre base of oakmoss absolute, labdanum absolute and bergamot essential oil supports loads of warm, earthy patchouli, brown leather, fine tobacco, a touch of agarwood and sandalwood, frankincense and vanilla accord. 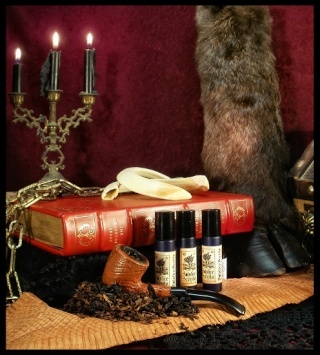 It is a masculine and complex scent that is very brown leather and tobacco heavy. Upon initial application, bergamot top notes tickle your nose as the oakmoss, earthy patchouli and sweet balsamic amber lurks just beneath. After just a few seconds Devil's Tongue gives way to rich brown leather followed immediately rich cured tobacco. This is a strong, powerful, rich scent that is unabashed and unafraid. Supporting notes of sandalwood, vanilla, agar and more contribute additional depth. The leather and tobacco eventually subside and meld with the chypre and the patchouli begins to peak out. Great staying power, very strong. The leather and tobacco notes in this blend are brand new to the shop. This scent contains a great deal of essential oils and absolutes. The bergamot used is Bergeptene-free. No doubt this is a serious leather scent. Leather it typically an iffy scent on me and right now this is all leather. I have a feeling it's going to age really well. Right now it's too much all on it's own so I've been layering it with Jack & The Devil or Roasted Chestnuts & Marshmallow. I was really looking forward to this scent after reading the description. It's very much right up my alley with the scent notes that Angela had listed. The only problem is sometimes I find leather notes in perfumes to be overpowering at times and also a bit "fake". The minute I put this on it grabbed me. I think it was the combination of the Bergamot and Oakmoss. Those two scents have become favorites of mine, especially where Angela's products are concerned. It starts out VERY earthy and just like her description mentions... then comes the leather and tobacco. This leather note is GLORIOUS! It's not that fakey leather scent that bothers me so much. This is very warm... soft, but strong. It doesn't smell artificial at all. Combine that with a warm tobacco note and I'm in heaven! What makes this scent so great is it's not just leather and tobacco... it's combined with amber, sandlewood, vanilla and other scents to round it out. It's strong and masculine, yet dries down to a softer combination of some of my favorite scent notes. LOVE this! This is such a wonderful leather scent. It is not a fake leather, but a nice warm manly leather scent. I love to wear it when I am in need of a little comfort. It is almost like curling up to your favorite leather jacket or your favorite man! Thorton,I love the way you described this scent. Leather jackets are my go-to outerwear. Maybe I can convince my man to wear this scent. Another scent with one of my "key words": tobacco. The sound of chypre gave me pause, but only briefly because everything else sounded so perfect. This is a great scent and probably my fave of the bunch*. It is very leathery and I can't discern the tobacco as much as I would like, but that doesn't detract from the overall blend. The chypre is present, but it doesn't screech at me or make me cringe like many chypres do. Instead, it melds nicely with the leather to create a scent that, to me, approaches something almost fresh or invigorating. It becomes warmer and richer smelling on the skin. The staying power on this is pretty good and if I recall correctly, I managed about five hours out of it the last time I wore it. Some Solstice Scents blends have a bit of a muted quality and I find this one to be one of the stronger smelling ones. However, it isn't so bold that people a mile away will smell you and cringe. Like Foxcroft above, this scent is unisex for sure and leaning toward the masculine. But women can and should wear it. * of the autumn releases. I personally love dark scents. I tend to prefer unisex or male perfumes to sweet feminine perfumes. So Devil's Tongue is perfect for me. It is a cyphre, which means it has fresh, green notes. I get a hint of oakmoss, patchouli, bergamot and labdanum. And there is definitely leather and tobacco there. Two ingredients I love in a perfume. I think this is a great blend, the notes work wonderful with eachother and the staying power is amazing. But I have found that all Solstice Scents perfumes have great staying power. I just got a sample of this yesterday and I think it has already taken the title of my favorite Solstice Scents fragrance. I love resins, leather, patchouli, and more traditionally masculine scents, and this one is so fantastic, dark, complex, and warm. It reminds me of Black Phoenix Alchemy Lab's El Dorado scent when I first put it on, but Devil's Tongue is warmer, smoother, and more wearable to me. In any case, I just love this stuff <3. I'm a big fan of leather scents (though they can be too dark or chemical-y from some companies) and this is my favorite leather scent ever. I want to roll around in this fragrance. I really liked this at first - lovely, warm and musky - but unfortunately leather hates me and it just seemed to overpower the whole blend after a few minutes, I'm sad! The comparison to BPAL's El Dorado rings true, though this one is a lot more LEATHER. When I put it on, it almost has a gasoline type oily note then amps up leather...like a guy riding a motorcycle. It's dirty and indecent. I like it! It screams "bad boy" to me. A beautiful and refined fragrance. It comes across to me as deliciously dry and not overly sweet despite the tobacco, amber and vanilla. Again a lovely depth is to be found in this fragrance with a refined complexity that seems to characterise all of the non gourmet fragrances of this house. I like the analogy of putting on well worn comfortable leather coat, because that it how it feels - protective and part of you. There is a 'sparse' richness effect, which again has been well thought out. The ingredients all speak of something that should be almost like treacle in their thickness, yet the end result is wonderfully restrained and peaceful - every note contributes to the whole without dominating. Despite this apparent openness, Devil's Tongue remains enormously interesting to smell from start to finish. It performs the same way in both light applications and heavy applications and has all the classic elegance and strengths of fragrances like Aramis (Aramis) and Derby (Guerlain). The opening is exactly as described with labdanum anchored by oak moss coming immediately to the fore, what I think I enjoy most is effect of the frankincense. If Violet Truffle has a violet note at the top, then Devil's Tongue has frankincense tickling at the bottom providing ongoing interest. The patchouli, wood and leather notes give an outdoors twist, while the vanilla and tobacco make it eminently suitable for both office and weekend wear. A very well composed classic Chypre which you have made your own. The end result is a wonderful harmony with everything in it's correct place and at just the right strength. I find it extremely easy and pleasurable to wear, just like that comfortable leather coat. This one was very dark, sharp and slightly sinister on me. It's a perfume version of Tom Waits. Fascinating, but not something I could wear. This was the 1st SS perfume that i truly enjoyed. It was strong and heady and very true to its description. I just didn't expect that the description provided by Angela would be so realistic. No matter how much i love this perfume, i think the sample i own will suffice. This is like Library combined with Manor. I don't get Bergamot on my skin but the leather is exactly the same note in Library, sitting on a bed of vanilla. I like this better than Library which I find to be much more masculine. I agree with queenshaboo that the leather in this is exactly the same as in Library. I also find it equal to the leather in Gibbon's Boarding School. I was looking forward to this and I found I didn't care for it. I don't particularly care for the house leather note in the first place, and it is quite strong in this. I also agree with rinster that this is sharp, and I can't wear it. It reminds me of a gruff 50s+ biker gang dude who will not ever admit or own up to any part of his feminine side and thinks smiling makes you look weak. Funny that Fascinoma was also reminded of motorcycler. For a reference of whether your nasal inhalatory preferences are similar to mine, my favorite solstice scents are Old Havana, Vanilla Pipe Tobacco, White Fox, and High Noon. My least favorite are Pinyon Truffle, Sacred Vow, and Devil's Tongue.